How Twitter Accounts Get Hacked & How To Stop Them! Twitter accounts getting hacked is a common phenomenon. Many users, especially who are new to this platform or are not too tech savvy wonder how twitter messages go out by their name without they sending it. This article shows exactly how 90 percent of twitter accounts get compromised. Few of twitter users may have noticed a direct message landing in their direct message inbox with a tinyurl or a bitly link with a compelling short message like “is this what you mean? tinyurl.com/xyzxyz” or simply “What? tinyurl.com/xyzxyz” or variations of such message. 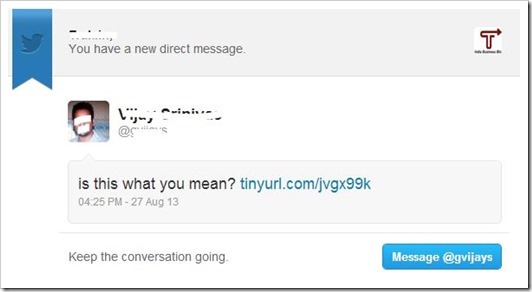 When users see such a direct message, they are obviously click on it. And in most cases it is from another twitter user they already know. Because it is a direct message, it comes from someone you are following and you trust them. When you click on the link, you are presented with a screen which looks exactly like a twitter screen on your web browser. Most of the users feel that Twitter is asking for the password, because not only does the screen look exactly the same, even the url of the website seems to of twitter. Here is the screen that is exactly presented to you. 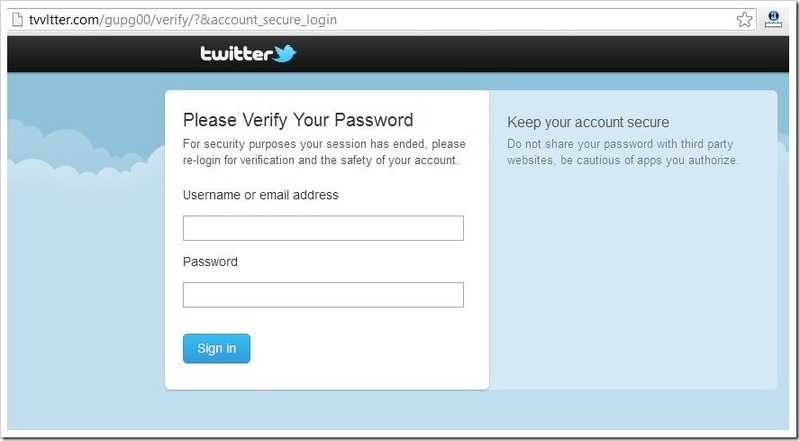 For most users, it will look simply like Twitter is asking for password for security purposes, and they will enter it. This is moment when you enter the password, the account gets compromised. Let me tell you how. 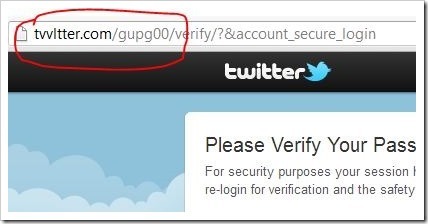 See the screen carefully, especially the url of the website – If you see closely, you will see that it not actually a twitter URL, it is tvvItter.com instead of twitter.com. Once you have given your real password, you account is hacked. The hacker knows you password now and has full control over you account. You will not even know your account is compromised, because in most cases, you account is just a doorway. The perpetrators will now send similar messages to your friends and followers and you will hardly notice it. That’s how twitter gets hacked, and you remain unaware of it! Even as I write this, there are hundreds and thousands of accounts that may have been compromised, and those users do not even know about it. If you have recently got a message like this and clicked on the link, the first thing you need to do is change your password. How Can You Keep Your Twitter Account Safe? The precautions are simple – Whenever you get a message with a link that asks for your twitter or any other password for that matter, just close it. Also, watch the url carefully – In most cases, they are very similar to original websites. How many of you have fallen to such stunts on Twitter? While one might miss out the URL, one should not miss observing the security certificate. In all latest browsers, the name appears in full instead of just the lock icon – for twitter as Twitter, Inc. (US).